“Tower” (2016, about 84 min), directed by Keith Maitland, is a riveting reenactment of the University of Texas Tower Shooting perpetrated by Charles Whitman on August 1, 1966. The film, from Kino Lorber, was broadcast on PBS Independent Cuts on Tuesday, February 14, 2017. Whitman would later be found to have a brain tumor on autopsy. The film is largely animated, much of it in black and white. The film reenacts the experiences of several victims, mostly in animation, sometimes with black and white footage of the event. One of the most prominent is Clarie James, the first shot, who was 8 months pregnant. Her boyfriend was shot and killed instantly. The baby would not survive. Another was a paperboy Alex Hernandez. One pair of young men was playing chess in a rented house when they heard the shots. White resigned the game. One civilian, Allen Crum, a former Air Force gunner, assisted police in the difficult counterattack, which ended the rampage in 96 minutes. He declined payment for his day of being deputized. The film opens with a popular song in 1966 that I remember hearing at the University of Kansas, where I was a graduate student then, “Monday Monday”. The film was followed by a 10-minute featurette with glimpses of several other recent mass shootings, and with discussion of the recent Texas concealed carry law, which allows concealed handguns by licensed owners on the campus of the University of Texas. The film showed a particularly handsome male Pd D graduate student packing his weapon before going to class on a bicycle. 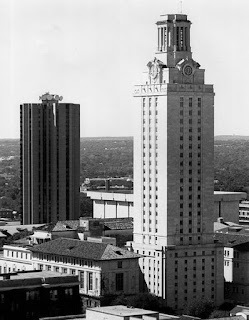 Wikipedia attribution link for older picture of University of Texas tower by Larry D. Moore, CCSA 3.0. There was a TV docudrama "The Deadly Tower" by Jerry Jameson in 1975 which I vaguely remember seeing. PBS also showed a trailer for “Newtown”.